We continue to do well this year. 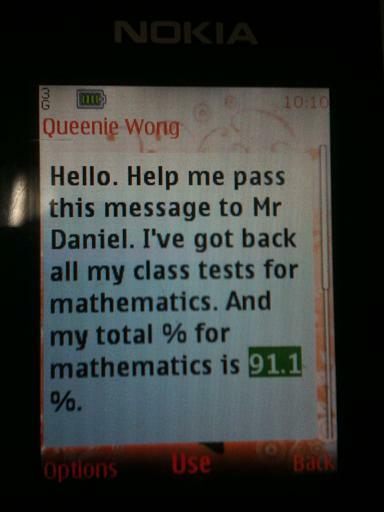 Queenie (our student with her SMS below) did really well after joining us. From below 20% in Sec 3 E Maths in Nov last year, she recently improved to 91.1%. We are elated that Queenie’s hard work has achieved tremendous success under Mr Daniel’s guidance. Thank you, Queenie and Mr Daniel, for your hard work and excellence! Recently, I received a message from my ex-teacher from RI Maths Club. He’s since moved on, but he remembered me after 15 years, and through his referral, Scholars’ Village was honoured and grateful to have the opportunity to grow successes in Maths Olympiad at Ngee Ann Secondary School. I hope that this will be a platform for us to build future successes at more schools, so that we create more talent for the future of Singapore.